Growing electric vehicle penetration, the increased use of renewable power and more recycled materials in new products have helped Nissan cut its CO2 emissions by 22.4% in the past decade. The Japanese brand’s annual sustainability report has seen it lay claim to being the highest-performing automotive company tracked by the Carbon Disclosure Project, which works with thousands of companies to tackle climate change. Improvements in sustainability reflect initiatives such as the Nissan Energy Saving Collaboration (NESCO), which measures energy loss at Nissan plants. Nissan UK has installed 19,000 solar panels at its Sunderland plant. They joined ten existing wind turbines and together generate enough power to build more than 31,000 cars every year, accounting for 7% of the plant’s total usage. Efforts to reduce energy consumption and emissions at facilities coincided with continued innovation in the development of zero-emission vehicles. 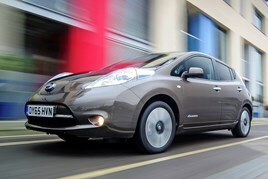 More than 200,000 Nissan LEAFs have been sold since the vehicle was introduced. Nissan partnered with Enel, Europe’s second-largest power company, to develop an innovative Vehicle 2 Grid system that allows drivers to use their vehicle as an “energy hub” with the ability to store and return electricity in excess to the grid.